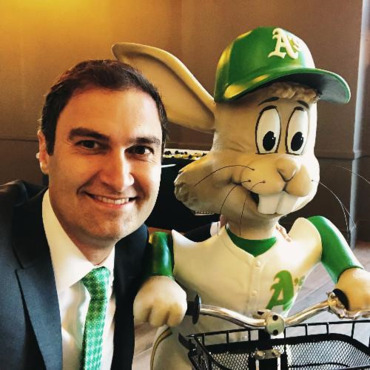 Dave Kaval is the seventh and current President of the Oakland Athletics of Major League Baseball. Prior to working for the Athletics, Kaval founded the independent Golden Baseball League (GBL) in 2003. Kaval also previously spent time in the Office of the President of the United States in Washington, D.C., where he worked on the National Security budget as part of the Office of Management and Budget (OMB). Kaval became president of the San Jose Earthquakes of Major League Soccer in 2010. During his time with the Earthquakes, he raised its level of marketing, which led to Avaya Stadium being regularly sold out. In addition, Kaval spearheaded the creation of the California Clásico at Stanford Stadium between the Earthquakes and LA Galaxy. He stepped down from the position on May 31, 2017 to focus on the Athletics. In November 2016, Kaval was named president of the Oakland Athletics succeeding Michael Crowley. As President of the Athletics, one of Kaval's first moves was to aggressively increase the amount of marketing the Athletics were doing, particularly in San Francisco. Kaval also announced office hours due to his beliefs in community involvement in sports. He also is committed to upgrades to their home stadium, the Oakland–Alameda County Coliseum. Kaval and the Athletics also committed to building a new stadium in Oakland, highlighted by the launch of their Rooted In Oakland campaign. Kaval is a main principal behind the construction of a new stadium for the team.